When taking to the outdoors for summer fun, no one plans on being a feeding ground to those pesky mosquitoes. Unfortunately, this happens more often than not. How many summer barbecues have been ruined by these infernal creatures? Not only do they prey upon humans, but also reptiles, mammals, birds and even some species of fish. Not only are these bugs one of the most annoying to deal with, they can also be extremely deadly. They are also known to play host to a library of different diseases that are both harmful and deadly to humans. In the United States, the West Nile Virus is alarmingly common. This is due to the transmission of the disease by mosquitoes. To decrease your risk of contracting the West Nile Virus along with other diseases that they may carry, the Mayo Clinic recommends covering the skin as much as possible and wearing mosquito repellent. But what about prevention in the home? How can you protect your family from these creatures and the horrible diseases they could be carrying? With over 200 species of mosquitoes, how does one go about keeping them from feasting on you and your family? There is no shortage of mosquitoes in the world, and there are plenty of ways to keep them out of your home and to prevent them from reproducing in your immediate area. Mosquitoes require water to breed, and there are plenty of ways to keep them from doing this in your home or yard. If there is a large amount of stagnant water surrounding your home, such as puddles, fountains, even pools, then this is a perfect place for mosquitoes to nest and create a whole new generation of life-ruining pests. We don’t always want to empty our pools, but regular cleanings can rid the water of their nests and keep their population around your home in check. Do the same with other water sources like fountains. These are beautiful features to your yard, and proper cleaning can make all the difference in the world. Another good way to prevent these annoying pests from bothering you and your family is to spruce up your lawn and your garden. This will attract such things like dragonflies, birds, bees, and other friendly creatures that feast on mosquitoes. This alone will have a tremendous affect on the balance of your home and the prevention of the blood-sucking fiends. Not only will the mosquitoes become fewer and fewer, but you will also be party to giving life to the creatures that are actually beneficial to nature. Another step you could take to eradicate them from your house is to treat your lawn and the surrounding foliage so that they do not nest there. Because they are weak flyers, they do not stray too far from their nests. Eliminating the possibility for them to breed and create a home in the plant life around your home is the perfect way to keep them away from you so they do not ruin your outdoor fun. Also, if your pets spend a lot of time outdoors, it could be helpful to treat them with flea and tick medicine. Sometimes mosquitoes hitch a ride on our pets and once we let them inside, the mosquitoes come with them, giving them more and more opportunities to feast on us against our will. Finally, you should treat the perimeter of your home to prevent them from slipping in through the cracks and sneaking inside without our permission. With this precaution in place, you can be assured that these uninvited guests won’t be able to invade our space any longer. Keep these steps in mind when planning your next barbeque. Even taking some of these suggestions into account can mean the difference between you having all the fun and them having all the fun. 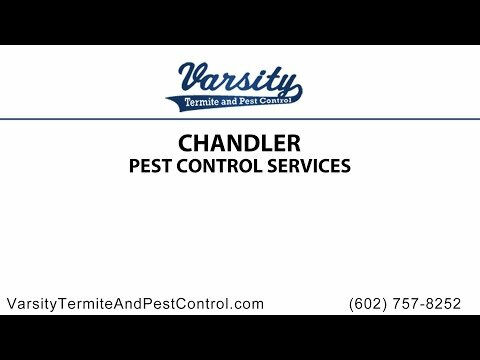 Luckily, Varsity Termite and Pest Control is ready to take on this job. Our team of professional pest control exterminators in Chandler is prepared to treat your home and lawn in order to keep the mosquitoes at bay. We have the tools and knowledge available to serve you and make sure your home is mosquito free. No one wants their summer fun ruined by these horrible monsters, so let us help. Contact Varsity Termite and Pest Control to keep your home mosquito free and your summer full of fun. Give us a call at (602)-757-8252 and we will start your mosquito treatment today.